Over the years, a number of articles have appeared on-line about PC Design and our line of Pulp Fiction Postcards. In the cases of the Metro and TackyLiving, I was contacted directly. The other was written independently. A local weekly event here in Palm Springs is the year-around Thursday evening "VillageFest," an outdoor market which takes place along some 4-5 blocks on the downtown main street, N. Palm Canyon Drive. It is visited by many hundreds of visitors each week (and locals as well) and I have had a booth there (at space N106, the 4th space north of Tahquitz Canyon Way) since June, 2014. I sell many of my postcards + handmade refrigerator magnets of my Pulpcards' and other images. In honor of VillageFest's upcoming 25th anniversary later this month, I was honored to be visited and interviewed by Bill Marchese last month, the author of the newspaper article that appeared in The Desert Sun. Click the "VillageFest Celebrating" article link -- the first link in the list below. 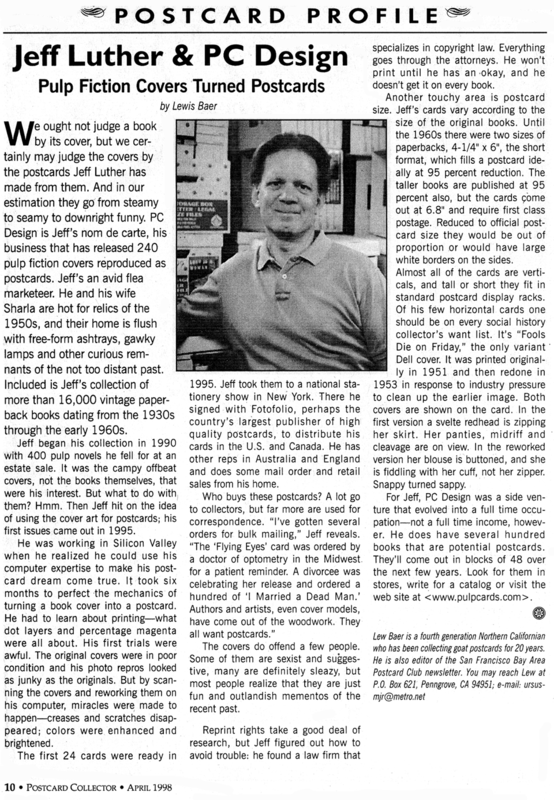 The paragraph about "Pulp Fiction Postcards" is underlined in yellow, just below the large photo halfway down the article.